What do you think??? 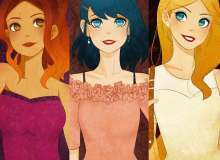 Who is your fav from this trio Chloe, Marinette or Alya?My fav are Chloe and Alya. Its sooo hard to make quiz who thought is that hard??? Do you have a crush?? What is your eye color?? What is your fav color?? What means a lot to you?? Quiz topic: Am I Alya,Marinette or Chloe?